AUSTIN, Texas, March 1, 2018 /PRNewswire/ -- With Presidents Day in the rearview and Memorial Day down the road, people might put their shopping lists on the back burner. However, there are many sales that will be springing up before the next major holiday. Pointing the way is RetailMeNot's Shopping and Trends Expert, Sara Skirboll, who says "Retailers will frequently use the change in seasons as a way to encourage shopping in stores, and 2018 is no different which is great news for those in need of winter apparel, gardening supplies or the soon-to-be vacationers." With warmer temps naturally come thoughts of gardening and getting away, and those are two top categories offering big discounts this month. Shoppers should remember though that thinking ahead – even to next winter – is never a bad idea. Skirboll agrees: "What I love about March sales is that families can save on items for the whole year, not just the spring." Now that travelers have their luggage in hand, it's time to book that tour package, hotel stay or cruise. Travel season is about to pick up and vacationers of all kinds can save. Those who love the high seas should book soon, as March is the end of what the travel industry calls "Wave Season," when many cruise lines offer deals. If riding the rails is the preferred method of travel, now is the time to book! 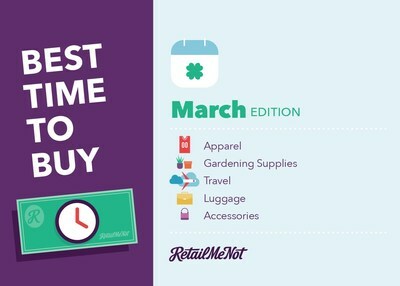 Recent RetailMeNot research shows that train travel is among the highest discounted method of transportation for March. So regardless of the destination or vehicle of choice, travelers can look at Hotels.com, Hotwire and more for the best savings. Warm-weather wardrobe styles are starting to roll out, and so are the accessories to match. Shoppers will be able to snag designer sunglasses, purses, watches and more for a steal. Don't be discouraged by the "last year" language as some styles are timeless, and saving money is always on-trend.